My old neighbour in Petawawa first introduced me to lentils many moons ago. I was at her house while she was making supper and she offered me a bowl of lentil rice when she discovered I’d never tried lentils before. I loved the recipe so much I asked her to write it down for me. I still have that handwritten recipe tucked away in one of my cookbooks. Since then, I’ve made her recipe for lentil rice many times and experimented with a few new lentil recipes. I even like eating lentils on their own. I’ll open up a can of lentils and heat them on the stove and serve them with a little salt and pepper. They are healthy and yummy! This recipe for Warm Lentil Salad is fragrant with spices and has fresh veggies. I find lentils filling so this to me is a meal all on its own. You could also pair it with some chicken or lamb. To save time use some canned lentils heated up on the stove. No one will ever know. I had a bag of dried lentils I’m trying to use up so that’s why I have the extra step to cook them. 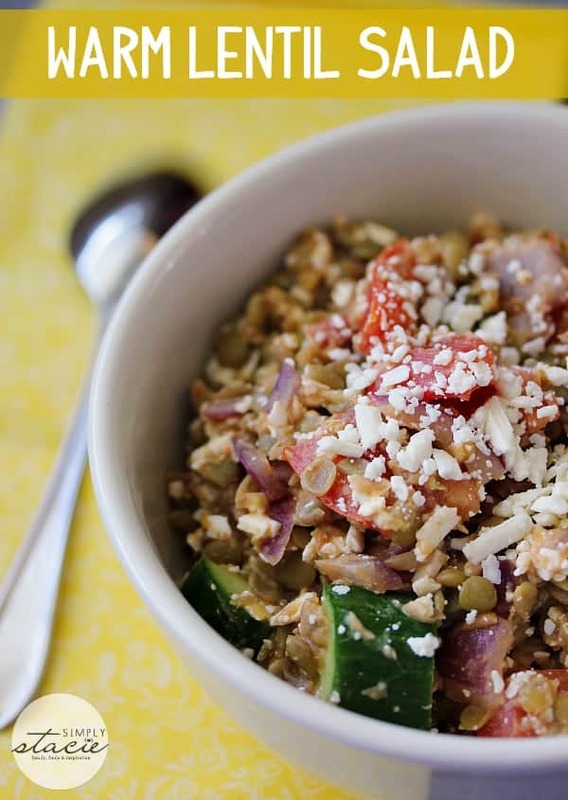 A fragrant blend of spices, veggies, green lentils topped with fresh Feta cheese. I find it filling and a meal on its own! Place lentils in a pot on the stove and cover with about 2 inches of water. Bring to a boil and then reduce heat to simmer. Cook on low for about 25 to 30 minutes. Drain. Heat olive oil in a pan on the stove over medium heat. Add in onions and stir occasionally for about 5 minutes. Then add in garlic, tomatoes, cucumber, cumin, ginger, paprika, cayenne and stir and continue to cook for about 3 minutes. Add in the cooked lentils and stir for a minute. Finish with the lemon juice, salt and pepper. Remove from heat and put into a large bowl. Stir in Feta cheese and serve warm. Looking for new ways to incorporate lentils into our diet- this looks like a good one! Thanks! Looks really good. 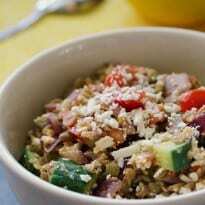 I love lentils and can’t wait to try this recipe.
. I have never tried lentils and I can’t wait to give this recipe a try. This would make a great dinner for my husband and myself! We both love to use lentils in our cooking! This looks wonderful! my hubby just started eating lentils and this would be great to try out! Love lentils but have not cooked any lentil dish. I like this recipe! I have never had lentils prepared this way, it looks delicious, I can’t wait to give it a try. Thank you for sharing this recipe. I love Lentils because they are cheap to buy and a very healthy protein to eat. I like your Warm Lentil salad and will have to make this for my family. I am sure that they would love it. Thanks for the tip about being able to heat them on the stove. I’ve never made lentils, but this looks like a good recipe for our cooler weather. I actually have some green lentils in my cupboard that I don’t know what to do with. This looks yummy! That looks really good. Thank you for sharing. I love lentils! This salad looks really good and I think I’ll go ahead and make some for tonight! I love it when things can be delicious AND nutritious, yum! OH YUMMY! I love lentils. This looks very yummy! Sounds delicious. A great recipe for fall! I’ve never really liked lentil salad because I detest cold lentils. I’ve never thought about having warm lentil salad though! I’ll have to try this! 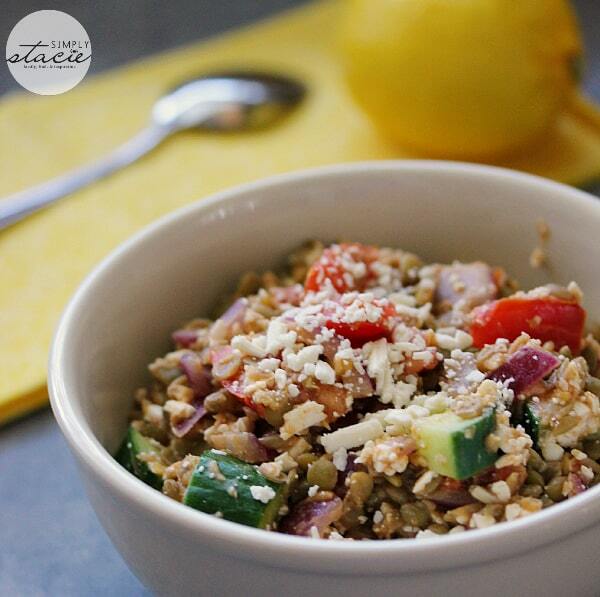 This looks good – I’ve never had a lentil salad before but it looks so good! oh this warm lentil salad sounds delish. I have printed and will be making this soon! If you haven’t already please stop by our Snickerdoodle Sunday sometime! never heard of lentil salad but this does sound good! This looks like a great way to get protein while cutting back on red meat. This looks incredibly delicious! I love Lentils especially Lentil Soup. I pinned this to try later. I’ve not had lentils much, but this recipe looks amazing. I like lentils but don’t have many recipes for them…only a handful that I repeat over and over. Thank you for sharing! I love lentils and this looks delicious, can’t wait to try, pinned! This looks absolutely wonderful! 🙂 I usually make soup and never thought to make refreshing healthy salad! This looks good! and a great way to get protein, definitely gonna try this! I love lentils and will try this salad. This recipe looks amazing for these cold winter months thanks for sharing. My food goal this year is to eat more healthy foods and I have been on the lookout for healthy and tasty recipes.